A good crowd came to hear Spaceman Paul Symons perform his new Shooting Stars with his band. At the Kiwi Valley or Flax Cafe in Henderson Road, it was our pleasure to get the party going with half a dozen songs. 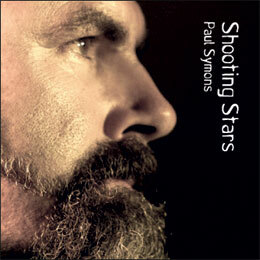 Shooting Stars is all new songs by Paul Symons, fully fleshed out with the amazing rhythm section of *Lott* Larson on Double bass & Des Mallon on Drums, at he live gig he add Janek Croyden on pedal steel, Wisenborne and lap steel. According to Paul the album started out as a brace of solo songs that grew into full arrangements with beautiful harmonies. If you’d like your very own copy, contact Paul or come along to a gig. Launch gigs October 2011, dates on homepage. Ask him if he has any copies of his 2005 CD Spaceman – You won’t be disappointed. This entry was posted in Archive on October 5, 2011 by Pete Parnham. This entry was posted in Archive on September 15, 2011 by Pete Parnham. What a reception. We went down a treat. Neil and I had originally got the gig as a blues act label based on the Stop and Listen album, but what the heck, when we add Bryan we really go to a whole new place, and we are not just talking another suburb in bluesville. So after five or so song we got Bryan up and let rip, starting with ‘Stuff you gotta watch’ a Muddy Waters tune that is fun to play and pretty catchy. Had to go back twice to give ’em another. What a fun place to play, really friendly people, and foot-stomping appreciative. This entry was posted in Archive on September 5, 2011 by Pete Parnham. We were all guest artists at the Wellington Folk Festival – but not as The Remarkables. Neil and Pete are playing as a duo, as seen on our album Stop and Listen, and Bryan is part of Tui Award-winners Wires and Wood. During our day concert Neil and Pete got Bryan up for a few songs, we hope you other festival organisers were tantalised, cause you’ll be hearing from us. 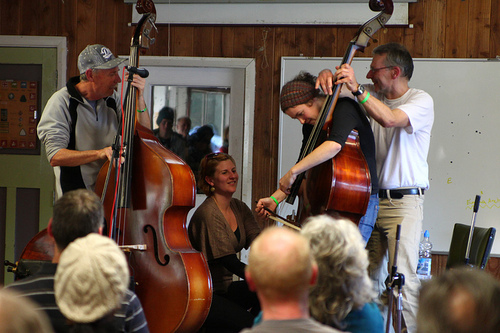 I ran a bass workshop with Holly Downes, Venessa McGown and Gary Trotman. All eyes were on Holly and Vanessa who showed where you can take the instrument with enough dedication, but Gary threw in the occasional one liner to keep it light and funny. This entry was posted in Archive on July 8, 2011 by Pete Parnham. Always a good crowd over at Titirangi. It was a good set up up on the stage – with a nice PA and great sound thanks to Ian Bartlett and another guy whose name I didn’t catch – sorry. This entry was posted in Archive and tagged gigs on July 7, 2011 by Pete Parnham. This was a great evening in a nice warm venue with a crackling fire, and a great crowd – that pretty much filled the place. Thanks for coming everyone, we had a great time but focused on the music and forgot to take photos. This entry was posted in Archive on July 6, 2011 by Pete Parnham. This was the first gig, I had a call from Graham McGregor asking if our country band Too Far Gone was able to do this gig, but Martha Louise was out of town. I have a rule. If my calendar is free I say yes. This approach has one great advantage, unlike most of the bands I’ve been in the name was made up on the spot, so we didn’t have to waste time trying to think of a name. Mind you it was recycled from a band I had back – well the 1980s I think ‘Cecil Peak and the Remarkables.” Try either of those names in Google – they really exist across the valley from one another. Anyway the whole thing at Rafters was fun so we decided to keep it going.